The seventh planet from our sun gets a lot of flack for its name, but the ice giant Uranus wasn’t always called that. For nearly 70 years after it was discovered, it went by a much less unfortunate name: George. 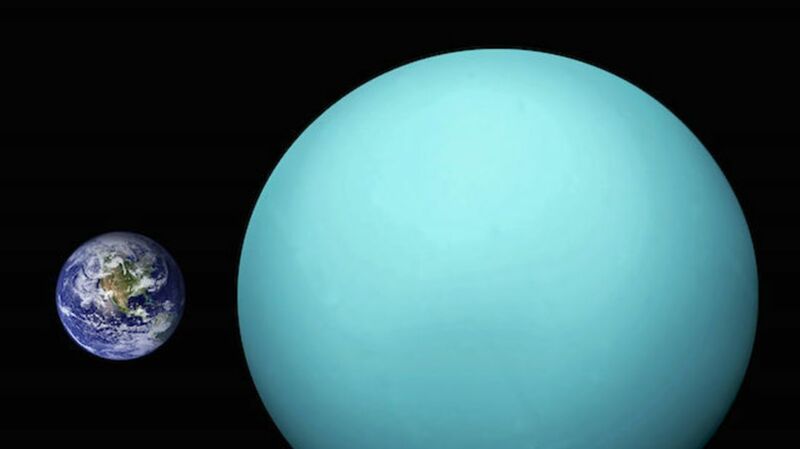 Uranus’ distance from Earth is so enormous—746 million miles when the two planets are nearest to each other in orbit—that its reflected light is dim, making it appear more like a star than a planet. Astronomers could see Uranus in the sky, but they all mistook it for a star until March 1781, when William Herschel used a telescope to discover that Uranus was actually a planet. Born in Germany in 1738, Hershel moved to England in his late teens. Earning his livelihood by composing music, playing organ, and teaching music, Herschel rented a telescope to indulge his interest in astronomy. In 1774, in his mid-30s, he built his own telescope so he could survey double stars in his spare time. In March 1781 in Bath (a town in Somerset, England), Herschel realized that an object he spotted was moving slowly, night after night, and concluded that the object was probably a comet or a planet rather than a star. After he told the Royal Society about his discovery, astronomers in other countries (Russia and Germany) calculated the orbit of Herschel’s find. Based on these calculations, the astronomy community agreed that it was indeed a planet. King George III rewarded Herschel for his discovery by appointing him as the official Court Astronomer, and at the request of the king, Herschel moved closer to the royal family so that they could use his telescopes to look at the sky. To honor his royal boss, Herschel named the planet he discovered Georgium Sidus, Latin for "The Star/Planet Of George." Other astronomers didn’t like how English-centric the name George was, so they suggested alternatives. French scientists called the planet Herschel, but German astronomer Johann Bode’s suggestion of Uranus became the most popular. Bode named the planet after Ouranos, the ancient Greek mythological god, to fit with the convention of naming planets after deities from classical mythology. Officially, though, Uranus was known as Georgium Sidus for nearly 70 years until 1850, when Her Majesty's Nautical Almanac Office (HMNAO) finally changed the name to Uranus. Because of his discovery, Herschel became hugely respected by scientists and European nobles, and he received grant money to build better telescopes. In 1821, Herschel became president of the Royal Astronomical Society. In addition to discovering George/Uranus, Herschel’s legacy includes his work identifying thousands of star clusters and nebulae, as well as his discovery of infrared radiation in 1800. And though his Georgium Sidus name didn't stick, Herschel received an honor pertaining to his own name in 1816 when King George III knighted him, officially making him Sir William Herschel.